Throughout my motherhood journey, I’ve met so many moms who are bored at home or desperate to rejoin the workforce. But many are left wondering how to get back on the horse after an extended period of leave. While lots of experts advise moms to “stay current” with their industry during any period of leave, going on interviews and explaining that you left the workforce to enjoy your small children isn’t always an accepted response (fair or not). What ends up happening a lot of the time is truly sad: women who want to go back to work end up being told “no” so many times that they eventually give up and become full-time homemakers, even though they desire to do something else. I’m here to tell you that doesn’t have to be your story. 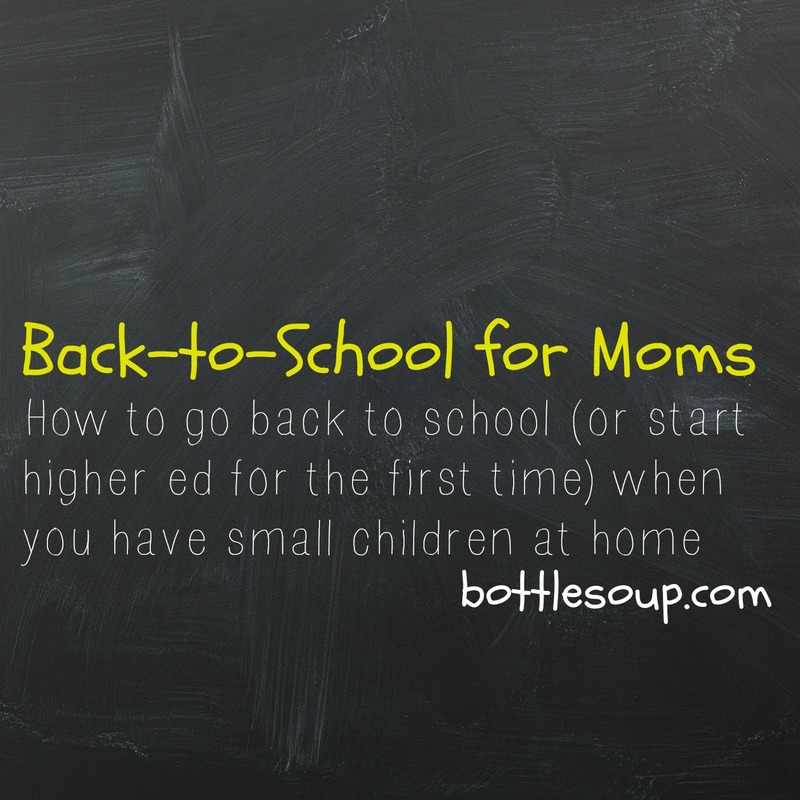 You can go back to school and bridge the gap between extended maternity leave and your return to professional life. These aren’t just words on a screen: I’m currently enrolled in a full-time, in-person Master’s program, and I have a 2 year old and an 8 month old at home. Crazy? I don’t think so. Busy, though, would be an understatement. It’s no secret that higher education is expensive. If you’re lucky, perhaps you live nearby a state college or community college that is relatively affordable. However, even the least expensive schools can come with a shocking, seemingly impossible tuition bill. What’s a mom to do? Explore scholarship options through your school first. Many times, there are scholarships for “non-traditional” students, which is any student starting an undergrad program at age 19+. Many moms meet this qualification. There are also scholarships from local businesses and organizations, such as your town’s Rotary Club, Lion’s Club, etc. that have relatively low competition for funds. You can always go beyond that and search for scholarships online, but be careful about giving your personal information out. Ensure that the site is trustworthy, first. Another option that many people hope to avoid is student loans. Student loans have a really bad reputation, but they don’t have to be big, bad and scary. If you opt for student loans, try to keep your entire student loan financing to federal student loans instead of private student loans. Federal student loans offer flexible repayment options based on income, the ability to defer your loans if you find yourself unemployed, and some are interest-free during full-time studies. The best option, aside from scholarships, is grants. If your family makes less than $80k a year, you likely qualify for some federal and state grants. In some cases, these grants cover the majority – if not all – of your college costs. Let’s say you’ve applied, been accepted, and find a way to finance your education. There are several ways to achieve free or low-cost, high-quality childcare. The first (and most obvious option) is to have a family member watch your child/children. If you have another parent in the picture, plan your class schedule around their schedule. If they work a typical 9-5, you can take classes in the evening. If they work nights, schedule your classes for morning/early afternoon. If you don’t have a partner to lean on, any other trusted family member or friend will do. Another great, often overlooked option is university childcare. Most colleges and universities have daycare on campus because professors, administrators, and staff need childcare – but as a student, you can also use these services! University childcare is amazing because it’s often low-cost and run by child development experts and students, so your children will receive the highest quality, state of the art care at a fraction of the cost of traditional daycare. Another bonus? Bringing your kids to on-campus daycare is super convenient! You can easily drop them off and pick them up, and check in on them between classes and study sessions. The last option is traditional childcare such as daycare centers, nannies, or babysitters. This depends on your budget. But a combination of family, university, and private resources can make childcare a realistic, affordable option during your studies. Ok, so you can pay for it, your children will be taken care of, but you still have your doubts: life is crazy enough with littles, do you really have time to go to class, study, write papers, and do research? The answer is YES! Have you ever had a super busy day and reflected on just how much you accomplished? It was probably a mix of sleep-deprived shock and awe, but you know what I’m talking about – those days when you get everything done, are thrown a few extra curveballs, and still survived. The key is to take everything one day at a time. But, also, being organized and knowing “the plan” will help you stay sane. Once the first week of classes begin, you’ll have a syllabus for each course, which outlines all your reading and work. Write it all down in your planner. Make sure big projects have “warnings” in your planner well ahead of the due date, so you don’t open up the next week to find you have 3 term papers and a midterm due by Tuesday. Yes, it will take some adjustment. Yes, it helps to have a solid support system. But you know what? It’s not impossible. You can do it! I believe in you.